In a country where the incidence of heart disease and diabetes is on the rise, and deadly pollution levels endanger the lives of millions, there’s one quiet health concern that doesn’t get much public attention: fatigue. 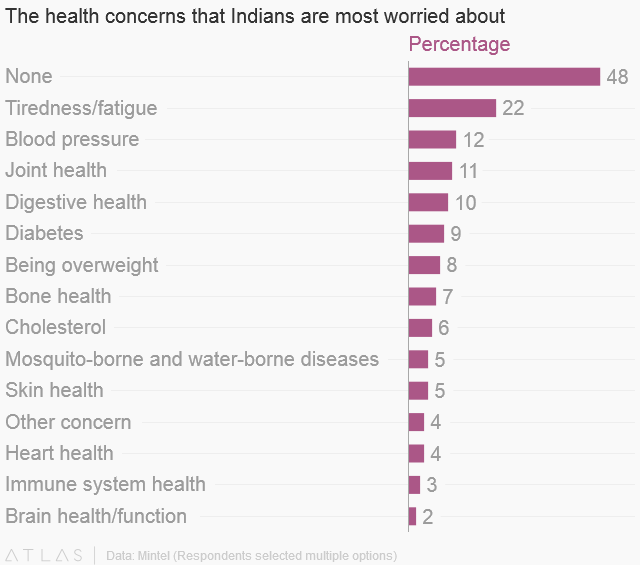 But over one in five Indians aged between 18 and 64 (22%) are concerned about being tired more than anything else, including blood pressure and diabetes, according to a recently released research report by Mintel. And this figure increases among women: 25% of Indian women interviewed by the market intelligence company said tiredness was their top health concern. Mintel surveyed 3,029 Indians last June. Given the nature of India’s work culture, these numbers are not surprising. If there’s one country that disproves John Maynard Keynes’ prediction (pdf) that the future would bring with it plentiful leisure time, it’s India. Work-life balance is a bit of a national joke, with employees working around 2,195 hours on average every year, far more than those in most other countries. Indian millennials reportedly spend a whopping 52 hours a week at work, outpacing their counterparts in the US, UK, and even China by quite a big margin. And last year, India was the world’s fourth-most vacation-deprived nation. But long-term fatigue is a public health problem, posing a risk to immunity. It can also be an indication of other, more serious conditions, including anemia, depression, and even diabetes, meaning it’s one health concern that everyone must definitely take more seriously. Try telling that to the Indians on nights shifts and long-duty hours.